Everyone is lovable. Everyone can give love. There are no exceptions to this possibility. One loving person, one truly loving person, changes the world. 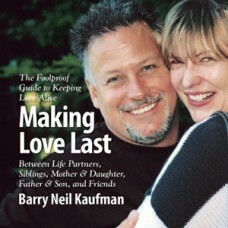 From this unflinchingly optimistic perspective, Barry (Bears) Neil Kaufman presents an unusually refreshing and instructive guide which allows us to easily harness our natural abilities to generate love, experience love and stay in love. First, Bears shows us why there is so much confusion and pain in our love relationships. He playfully challenges limiting beliefs such as "falling in love," "love depends on chemistry," "love takes time," and "love is selfless." Then, with gentleness and care, he offers seven principle upon which we can build lasting love relationships with significant others, spouses, children, parents and friends. Where the real "chemistry of love" is generated. Why waiting to "fall in love" leaves us out of control. That true love is not selfless but self-fulfilling. How to make loving a "no-risk" proposition. Three keys to making love a tangible experience now. How your love relationships can be a celebration of you, not a denial of who you are. How to separate love from longing. Seven principles for building (or enhancing) love relationships. Why giving love away delivers a deep, nurturing love that lasts.